I am not calm, I am unspontaneous. When something happens to me, I don’t know how to feel. We all have it in us to be an opium for every conceivable mass. Words just say what you want them to; they don’t know any better. Night Geometry and the Garscadden Trains. Alison Louise Kennedy is a Scottish writer of novels, short stories and non-fiction, and stand-up comedian. She contributes columns and reviews to UK and European newspapers. Kennedy studied English and drama at the University of Warwick. 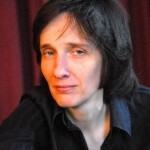 Kennedy currently lives in London and is an Associate Professor in Creative Writing at the University of Warwick,having previously taught creative writing at the University of St Andrews. She is principally associated with The Stand Comedy Club in Edinburgh.